Bill Gates is the Chairman and former CEO of Microsoft, a software company he founded together with Paul Allen. He is one of the most influential business leaders of the 20th century and revolutionized the world of personal computing. Despite this stature, he has also been severely criticized for his business tactics. He has been the wealthiest person in the world for most of the past two decades, with a current net worth of over $70 billion USD. 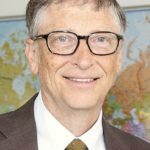 After stepping down from the helm of Microsoft, he has been active as a philanthropist supporting many initiatives through the Bill Melinda Gates Foundation. "Well I think any author or musician is anxious to have legitimate sales of their products, partly so they’re rewarded for their success, partly so they can go on and do new things." "Me and my dad are the biggest promoters of an estate tax in the US. It’s not a popular position." "If you’re using first-class land for biofuels, then you’re competing with the growing of food. And so you’re actually spiking food prices by moving energy production into agriculture." "In inner-city, low-income communities of color, there’s such a high correlation in terms of educational quality and success." "Climate change is a terrible problem, and it absolutely needs to be solved. It deserves to be a huge priority." "Since when has the world of computer software design been about what people want? This is a simple question of evolution. The day is quickly coming when every knee will bow down to a silicon fist, and you will all beg your binary gods for mercy."